KidKnits is honored to be able to share this short interview with Jillian, a 9 year old from Metamora,IL, and great friend of KidKnits. 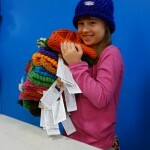 Jillian attended KidKnits classes with a local homeschool group and was inspired to do more to help. What did you enjoy about KidKnits? I liked KidKnits because I liked helping other people, because I learned a new craft, and I met more friends. I think it is amazing that a 9 year old girl thought of an idea to help with the poverty problem, and that the family put it to action. What is one of the main things that you learned from KidKnits? I learned that “the other side of the world” can be anywhere, even in your own neighborhood. What did you learn about poverty that surprised you the most? The thing that surprised me the most was that some women have to live on $1.25 a day. It is amazing that they meet all of their needs with that little amount of money. 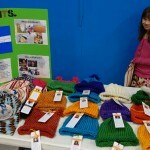 Tell us about your idea to raise more money for KidKnits. I felt inspired to raise more money for KidKnits because I felt like God was calling me to help those women. I decided to make and sell hats at the St. Mary’s Craft Fair. So I started knitting every day. I would knit in the car on the way to choir practice. I would knit during school breaks. I was pretty much knitting in all of my free time. I made different styles: brims, stripes, and pom-poms. I put the metal KidKnits tags on the hats so that people would remember why the hats were special, not just store bought. I also put on the tags that had pictures of the women. Then people knew which woman spun the yarn that I used to make the hat. I liked to count how many hats I had made so far. As I continued to make more hats, the pile in my closet got bigger and bigger. In the end, I made 19 hats. We got some kits to sell too. The night before the craft fair, I made a poster to stand up on our table. We printed pictures of the women from Rwanda and Chile and of Ellie. The next morning, we packed all of the hats and kits into the car and went to St. Mary’s. When people came to our table, I got to tell them all about KidKnits. They were shocked and impressed when I told them that I made all of the hats by myself. I sold 14 hats and 4 kits altogether. I felt really good being able to help. I sent the money to KidKnits so that it could go back to the women. Was there any particular woman whose story stood out to you? Yes. Janet’s story really stood out to me. She has to send her daughter to boarding school because there is no free school beyond 6th grade. That puts a large burden on the family, but she knows that education is important. Janet also takes care of her mentally disabled sister. She makes lots of sacrifices for her family. What was one of your favorite parts of making the hats? My favorite thing about making hats to sell was that I could think about the women that I was helping. Did you learn anything interesting about the yarn? An interesting fact that I learned about the yarn from Rwanda is that the dye is made from natural materials from the land. One of the colors is only available for part of the year because the flowers that are used to make the dye only grow at certain times of the year. What will you do next to help those in poverty? Actually, I helped at the Neighborhood House Christmas Toy Shop, where people in need are able to get gifts for their children. I also donated new and used toys. I felt happy that I could help bring joy to children on Christmas. I am always looking for ways to help others!